Linda Seccaspina was born about the same time as the wheel was invented and the first time she realized she could tell a tale was when she got caught passing her smutty stories around in Grade 7. After she wrote her own obituary in 2010 when Derek "Wheels" Wheeler from Degrassi Jr. High died, people told her she should think about a career in writing obituaries. Before she laid her fingers to a keyboard, Linda owned the eclectic store Flash Cadillac in Ottawa. The Ottawa Citizen newspaper labeled her "The Maiden of Death" even though they had no clue why and she has had to deal with the rumours for years. Linda has published four books and blogs here and there on Bubblews and Open Salon. She has been called the most stubborn woman in Lanark County and has requested her ashes to be distributed in any Casino parking lot as close to any Wheel of Fortune machine as you can get. But since she published her obituary, most people assume she's already dead. 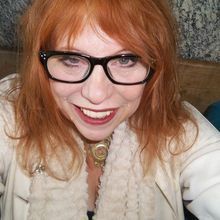 Linda writes for Lanark county's arts and entertainment newspaper TheHumm and for Florida's own Screamin Mama's magazine. I read everything that interests me- I shun nothing. I have been known to read the complete set of "Sweet Valley High" when my sister was dying from cancer. I read what makes me happy and apologize to no one. Welcome to Fictionaut, Linda. Hope you enjoy it here. You must log in to write on Linda Seccaspina's wall.